Exclusively here on 103-FXD, co-sponsored by Michigan Sales & Equipment, the John Deere store in Marquette. Register Now to Save your spot at any of our Showdowns for a chance to WIN. CONTEST IS OVER – Winners of ALL Showdowns AND Tractor Announced August 17th, 2013. Please see following link for photos and details: Check out all the photos from the Marquette Township Community Day at Lions Field, the Texaco Country Showdowns, and the John Deere Tractor Giveaway of August 17, 2013. 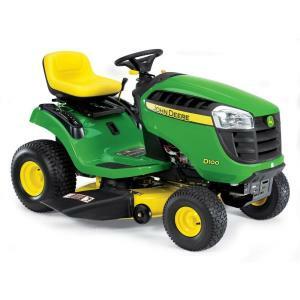 This year we will be GIVING AWAY A BRAND NEW JOHN DEERE D110 TRACTOR!!! Win This Tractor at the Texaco Country Showdowns in Marquette County! Anyone who attends a showdown as a spectator or performer can enter in to win the Tractor, and performers get a second entry! More Details about the Tractor Here! Check out the prize at GetATractor.com. Sing or play for a chance to win $1,000 and move up in the competition for a chance to win the National Prize of $100,000. You can perform up to 3 songs, singing along to a track is great or feel free to bring your guitar or keyboard. Soloists and bands with less than 7 members are welcome. Performers of any age are welcome so get the whole family involved. And… it’s just $20 to enter, so download the form below and register today. Download the form below or pick one up at the station. Turn it in at the station with $20 to secure your entry. For information on the State and National Competitions contact us at our main offices.